It took me a little while to remember where I knew Don Freeman’s name from, but it clicked while I was reading this. Freeman is the author/artist of the children’s Corduroy books — books about a stuffed bear that I used to read to my children quite regularly. It Shouldn’t Happen (To a Dog), while an illustrated book much like his Corduroy books, is not intended for children. Instead, Freeman writes (and draws) a story based on his military days, drawing (literally and figuratively) on the treatment of the enlisted soldier. The fact that Freeman is a black man compounds the inequality and treatment he receives. But as an enlisted man, he is unable to complain. In the course of the story, our soldier feels his treatment is so bad that he couldn’t be treated worse if he were a dog, and wakes up in his barracks one day, having turned in to a dog. We follow him then, being treated like a dog, yet hardly any different from any of the other soldiers. Writing/drawing an illustrated story, almost a graphic novel, is a great way to get a message across when you can’t speak up. But Freeman’s story is not as clear-cut as it could be. Our hero-dog manages to shine as a soldier, but then he winds up AWOL, but then back in the ranks. I’m not quite certain what point Freeman is trying to get across. It’s hard to respect and enjoy a soldier, even a dog/soldier, when he is not toeing the line. His exploits as a dog deviate from the sorts of things a soldier typically has to do. I appreciated seeing some of Freeman’s drawing work other than Corduroy and I greatly appreciated the historical look at the United States’ military during a turbulent time. Beyond that, though, this just isn’t a strong book. 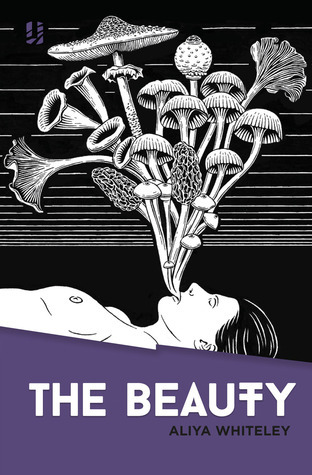 While the art looks like it’s for kids, the story really isn’t. And while the personal, historical look at the military is interesting, it’s not really told in a way that would rally history buffs to buy it at the book store. This is the sort of book you hope you can find in a local book store. Looking for a good book? 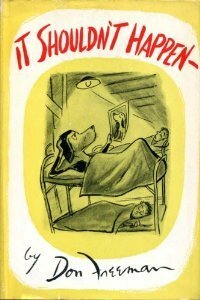 It Shouldn’t Happen (To a Dog) is a fictionalized personal account of life in the military, told through the drawings of a noted children’s book author/illustrator, Don Freeman, and may be of some interest to readers of history and military history. I am a fan of ‘bathroom reader’ books. You know … books with packets of information delivered in small bits so that you can read just as long as you need to and not get carried away by a story. Typically these are trivia books, or joke books, but Stuff You Should Know About Stuff, by Tripp & Tyler, which is neither, qualifies as bathroom material. In more than one sense of the term. Tripp & Tyler are apparently a comedy duo, though I am not familiar with them (I may have heard my children mention their name). This makes a lot of sense because it reads a lot like an attempt to put into book form a stand-up comedy routine. This is an idea that just doesn’t work, especially if, like me, you can’t hear the author’s voices. There were moments that made me chuckle, and moments when I nodded my head at the truthfulness of a humorous situation they pointed out, but these moments were far too few for a 200+ page book. The book delivers a college-male-eye-view at topics ranging from “Rules for My Waiter” to “Public Restroom Etiquette” (“Know when to hold it…and develop a minor intestinal problem rather than risk having the stench embed itself in your clothes.”) to “What to Do When There’s Awkward Silence” to “Checklist for Middle School Popularity in 1993” to “Things Guys Never Do with or Around Other Guys” (“Apply sunscreen to another man anywhere other than his back.”). I think you get the picture. I’m clearly not the target audience for this book, but then…I’m not sure who is. Is this the sort of book that would appeal to fans of Adam Sandler and Seth Rogan films? Quite possibly. Is that a big book-buying audience? Well…that’s not for me to decide. This is, however, precisely the sort of book I would keep in my bathroom for those times when I find I have a little time on my hands, should it be given to me as a gift. It is not, though, the sort of book I would buy on my own. Not knowing the authors were comedians, I was expecting a book to have a little more ‘fact’ — stuff I SHOULD know about — mixed with humor (“stuff”). Instead, it was college humor drivel. Looking for a good book? 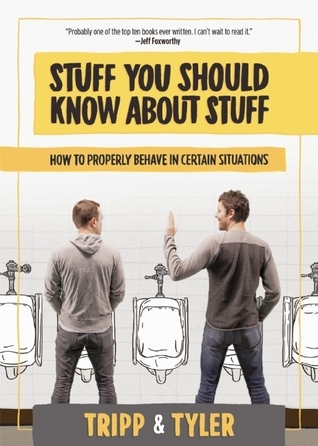 Stuff You Should Know About Stuff by Tripp & Tyler doesn’t really have anything you should know, but rather takes a slightly humorous look at things you already know. Yes! Finally a Star Trek graphic novel that combines an interesting, well-thought-out story with really terrific art wherein familiar characters actually look like the characters we readers know! 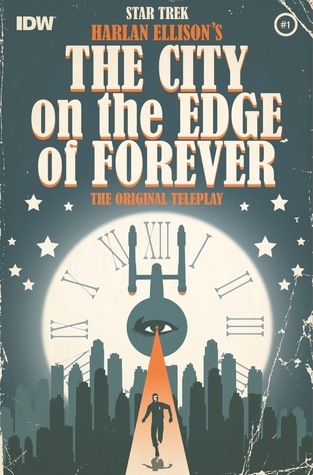 It helps that this book is a graphic novel adaptation of a much-loved Star Trek episode, “City on the Edge of Forever,” by noted author Harlan Ellison. So why put out a graphic novel of something that’s already in visual form? Because, as the cover boasts, this is based on the original screenplay, and not the episode as filmed and aired. Harlan Ellison is no small voice in the sf/comics genre and he’s boasted many times how much better his original version was than the studio-rewritten-and-filmed version. While the script as Harlan wrote (and rewrote) it has been published before, reading a teleplay can be difficult for those who aren’t familiar with doing so. Seeing it as a graphic novel is possibly the only way we will ever see this particular version of the teleplay, visually. First, I should note that although the cover of the book states it’s “the original teleplay,” it’s actually the original revised teleplay — see the published book, or Google it. I liked the story. I am not convinced it’s any better or worse than the episode as aired. There are some clear differences. Some of the aspects I liked more (the appearance of the Guardians), but some, such as Spock’s demeanor toward his captain, I liked much less. Credited authors Scott and David Tipton have done a fine job of converting the teleplay into a graphic novel, even though it is still Ellison’s story. J.K. Woodward’s art is tremendous. How often did I stop and stare at a page just to admire the way Woodward painted a panel or built a page? Let me see … how many pages are there? 128? Then I did this 128 times! Each page appears to be painted with acrylics, and Woodward manages to be consistent with his characters’ appearances AND actually makes them resemble the characters on which they are based! This seems to be a much more difficult task than you might think, based on previous comic/graphic novel incarnations! I actually went back to look over the book again, just to take a look at how Woodward put his work together. Often there was a slight monochromatic appearance to the panels, but it works, and it works well! Whether it was the Tiptons’ idea, or Woodward’s (or even Ellison’s) I don’t know, but I greatly appreciated all the little nods to Harlan Ellison. I don’t want to give them away, they are like little Easter Eggs to hunt for, but one of the more obvious ones is the window of a shop that sells “Strange Wine.” And because not everyone will know what Harlan Ellison looks like, it was a rather nice tribute to see Harlan himself play a small, but important role in the visual story. I’d really love to see these authors and artist work together again on another Star Trek story … whether it’s an adaptation of an early draft, or an unproduced draft (Theodore Sturgeon had been selling his unproduced script on Amazon! ), or something entirely new, this combination really worked for me. Looking for a good book? Fans of well-written and drawn graphic novels, as well as Star Trek fans should love this book. 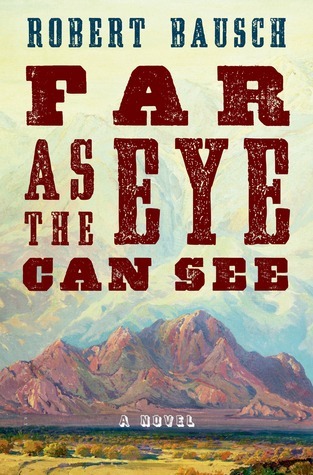 First, a big “thank you” to Netgalley and publisher Nan A. Talese for making this book available. Margaret Atwood is not an author who needs advance reviews from the average ‘Joe’ or small-time blogger. Still, it’s great for us to have the opportunity to see a copy of a book like this, from a well-known, well-respected author. So thank you. I’ve written before about how much I enjoy reading short fiction. One of the first collections of short stories that I remember reading and really enjoying (surprisingly, at the time, as it wasn’t sci-fi genre fiction which was all I read for a time) was Margaret Atwood’s Bluebeard’s Egg. it was, in fact, the book that turned me on to her writing. Fortunately, for anyone who enjoys good writing, Atwood hasn’t lost a step through the decades. Stone Mattress is a strong, strong collection. 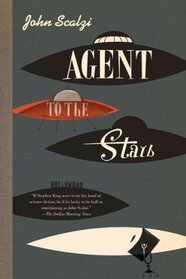 Some of these stories, much like her novel The Handmaid’s Tale, have a slight sci-fi bent to them, while there is also a hint of horror and touch of mystery. Each of them is a strong story, and while not all will resonate with every reader, every reader is bound to find something that appeals among these nine tales. The first three stories are related. In “Alphinland,” a widowed writer (Constance) is continually thinking of her late husband (Gavin) and how he’d react as she moves throughout her day. She recalls sometimes painful memories, such as when she discovered his infidelity. In the second story, “Revenant,” Gavin is a grumpy old man who doesn’t think much of Constance’s ‘pulp’ writing work, despite the fact that it supported them. The third story of the trilogy, “The Dark Lady,” is told through the eyes of the woman with whom Gavin had his affair. Any time I read a collection such as this, I can’t help but try to determine which stories were my favorites. That’s difficult here because I liked all the stories so well. I would probably look at “Alphinland” and “The Dead Hand Loves You” and “Stone Mattress” as my top three picks. “The Dead Hand” is the story of a successful horror writer who forged an agreement as a youth with his friends that each would share, evenly, their financial success should they achieve fame/success. And “Stone Mattress” is a revenge story of a woman who accidentally runs in to a man who ruined her life and she plots ways to kill him. Looking for a good book? 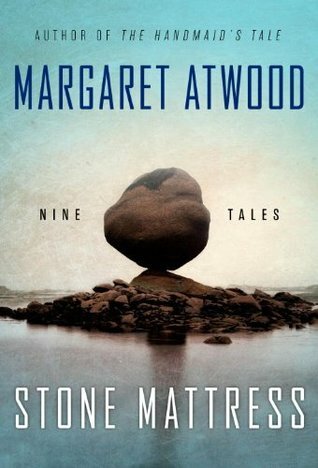 Stone Mattress by Margaret Atwood is a collection of nine tales that you really should own and read.